A rabbi who walked through the cemetery told NBC10 he counted 460 headstones that were toppled or damaged. Several groups are coming together to help with repairs at a Jewish cemetery that was vandalized over the weekend. NBC10's Brandon Hudson has the details. 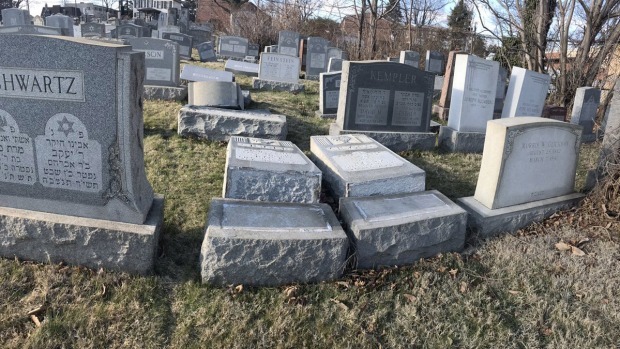 Vandals targeted a Jewish cemetery in the Wissinoming section of Philadelphia, knocking over hundreds of headstones over the weekend and the damage remained visible Monday. Police responded to a report of vandalism at Mount Carmel Cemetery on Sunday at 9:40 a.m. When they arrived, they were met by a man who told them three headstones belonging to his relatives were knocked over and damaged, authorities said. 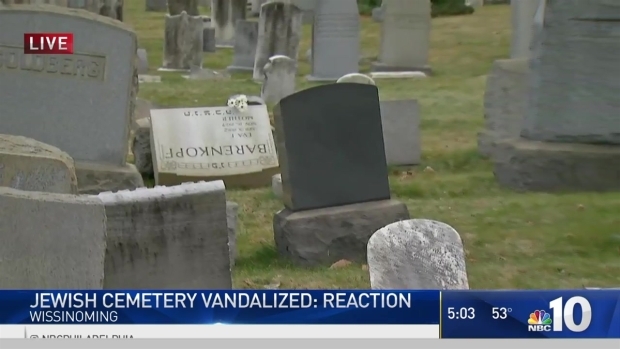 After a rash of anti-semetic incidents across the country, a Philadelphia cemetery has been vandalized. Hundreds of headstones were toppled over. NBC10's Drew Smith reports on the incident. "This is not just a random act," said Rabbi Shawn Zevit of Mishkan Shalom. "To topple so many headstones clearly is a concerted effort with intent." Anti-semitic vandalism and threats across our area have caused multiple groups to show their support of the Jewish community. No arrests have been made and police have not released information on any suspects. The Anti-Defamation League is offering a $10,000 reward for information leading to an arrest. The Fraternal Order of Police is also offering a $3,000 reward, bringing the total to $13,000. "In my time this is the worst that we have seen as far as anti-Semitism," said Nancy Baron-Baer of the Anti-Defamation League of Philadelphia. "We need to be more united and not so divided." "I'm devastated by this," said Janice Wilson of Overbrook. "I don't know whether to cry or to scream." "On one hand there's a sense of anger and grief, but also hope because we are seeing people coming together as sisters and brothers to show that the faith communities in Philly and in the USA will not be broken by these hateful acts," Goldman said. "We will be stronger, and the Jewish community and the faith communities will be stronger." Police believe the vandalism occurred between late Saturday night and Sunday morning. "My heart breaks for the families who found their loved ones' headstones toppled this morning," Philadelphia Mayor Jim Kenney wrote in a released statement. "We are doing all we can to find the perpetrators who desecrated this final resting place, and they will be prosecuted to the fullest extent of the law. Hate is not permissible in Philadelphia. I encourage Philadelphians to stand with our Jewish brothers and sisters and to show them that we are the City of Brotherly Love and Sisterly Affection." Pennsylvania Gov. Tom Wolf also called the vandalism a "cowardly, disturbing act." "We must find those responsible and hold accountable," Wolf wrote. White House press secretary Sean Spicer said Monday President Donald Trump condemns the latest act of vandalism in Philadelphia. An organizer launched a GoFundMe page to raise money for damage repair while the Jewish of Greater Philadelphia is organizing a cleanup effort for Tuesday. Philadelphia city councilman Bobby Henon, who grew up close to the cemetery, told NBC10 union groups will donate time and effort to clean the cemetery and install security cameras. John Dougherty of the Philadelphia Building & Construction Trades Council also offered to replace the headstones, re-sod damaged gravesites and clean the cemetery for free. The building trades council is the umbrella organization for more than 50 union locals that work in the construction industry. Dougherty called the vandalism a "cowardly act of anti-Semitism that cannot be "tolerated." Israeli Foreign Ministry spokesman Emmanuel Nahshon and the Anne Frank Center for Mutual Respect also condemned the vandalism. #Philadelphia Jewish cemetery desecration is shocking and a source of worry . Full confidence #US authorities catch and punish culprits . The FBI opened a civil rights investigation into the vandalism, the agency announced Monday. "The FBI will collect all available facts and evidence. As this is an ongoing investigation, we are not able to comment further at this time." The Philadelphia District Attorney's Office is also deciding whether hate crime charges will be filed as investigators work to determine the motive for the vandalism. 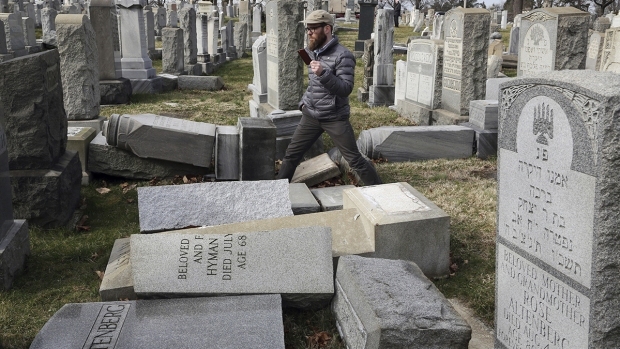 Last week vandals damaged 154 headstones at a Jewish cemetery in University City, Missouri. The incident sparked national outrage and a crowdfunding campaign from a Muslim group that has now raised more than $130,000. Some of that money will now go toward the Mount Carmel cemetery as well. More than 10 Jewish Community Centers across the country were also evacuated last week due to bomb threats. An investigation is underway after vandals damaged headstones at Mount Carmel Cemetery in the Wissinoming section of Philadelphia. Police say the suspect or suspects damaged 75 to 100 graves at the Jewish cemetery, located on Frankford and Cheltenham avenues. 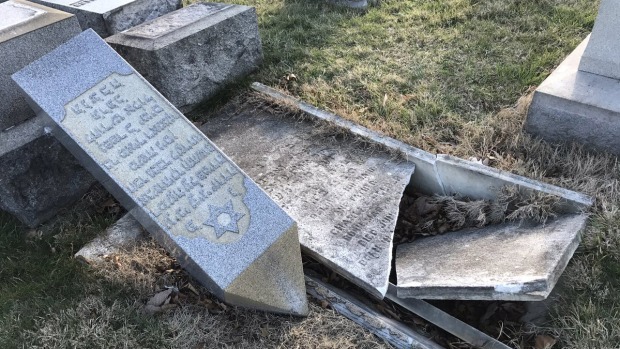 The incident follows another vandalism at a Jewish cemetery in University City, Missouiri last week in which 154 headstones were damaged. Vandals toppled headstones at the Mount Carmel Cemetery in the Wissinoming section of Philadelphia. This is just one of a number of attacks against the Jewish community across the United States. NBC10’s Cydney Long spoke to visitors at the local cemetery. A White House Representative also weighed in with NBC10 on the recent attacks.